Many speech-language pathologists have expressed uncertainty about the best way to help school-age children who stutter overcome their speaking difficulties. Common questions include: which children need treatment and which are likely to “outgrow” stuttering, what treatment methods are most appropriate for young children who stutter, how to incorporate parents in treatment and what to do if parents are not involved, and what to do if treatment is not “work­ing.” Dr. Yaruss has developed two-part series to help clinicians find real-world, practical answers to these and many other questions. Multi-disc audio recording (2 hours) with electronic manual and instructions. J. Scott Yaruss, Ph.D., CCC-SLP, BRS-FD, ASHA Fellow, is an associate professor and director of the Master's Degree programs in Speech-Language Pathology at the University of Pittsburgh. 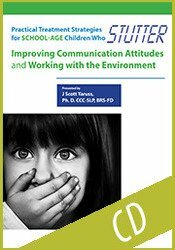 Dr. Yaruss's research examines factors that may contribute to the development of stuttering in young children as well as methods for evaluating stuttering treatment outcomes. He has published more than 130 papers, articles, chapters, or booklets on stuttering. He teaches classes on stuttering and counseling methods for speech-language pathologists at the University of Pittsburgh and frequently provides continuing education workshops designed to help clinicians improve their ability to work with individuals who stutter. This course consists of 2.0 self-study clock hours. Credit requirements and approvals vary per state board regulations. Please save the course outline, the certificate of completion you receive from this self-study activity and contact your state board or organization to determine specific filing requirements. 2.0 ISBE Professional Development (PD) Clock Hours will be made available through Quincy University. Those requesting ISBE PD Clock Hours will need to complete additional steps in order to receive the ISBE “Evidence of Completion for Professional Development” form. Expires: 06/30/20**. Indiana Educators: 2.0 Professional Growth Points are available for full attendance of this self-study package per the Indiana Department of Education standards. Montana Educators: This self-study package is offered for 2.0 Renewal Units. PESI, Inc. is an Approved Renewal Unit Provider with the Montana Office of Public Instruction. New Jersey Educators, Administrators & Education Services Personnel: 2.0 Actual Professional Development Hours (self-study). MEDS-PDN, powered by PESI, Inc., is a registered New Jersey Professional Development Provider with the NJ Dept of Education. Texas Educators: PESI, Inc., has been approved as a CPE Provider #500-981 for Texas Educators by the Texas State Board for Educator Certification (SBED). This self-study package qualifies for 2.0 CPE clock hours. This course contains 2.0 hours of self-study continuing education. It was not offered for ASHA CEUs. Please retain your certificate of completion. If audited for ASHA Certification Maintenance, you can submit this certificate of completion at that time. For state licensure, teacher certification renewal, or other credential renewal, contact those agencies for information about your reporting responsibilities and requirements. California Speech-Language Pathologists/Audiologists: PESI, Inc. is an approved provider with the California Speech-Language Pathology and Audiology Board, #PDP 319. This course meets the qualifications for 2.0 hours of self-study continuing professional development credit for Speech-Language Pathologists or Audiologists, as required by the California Speech-Language Pathology and Audiology Board.